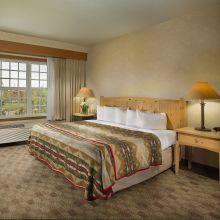 Embrace casual luxury and soothing rustic ambiance in our 181 spacious guestrooms. Join us at Hudson's Bar & Grill for a unique and delicious dining experience! 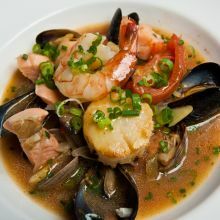 Call us at 360-816-6100 to make a reservation. As a loyalty member you'll always get the best rate when you book direct. Plus earn points for free night stays! Need help with planning an event? Submit an RFP form or call us at 360-816-0508. 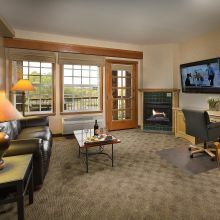 Relax, revel, and rejuvenate at one of the most scenic hotels in Vancouver, Washington. Welcome to The Heathman Lodge. 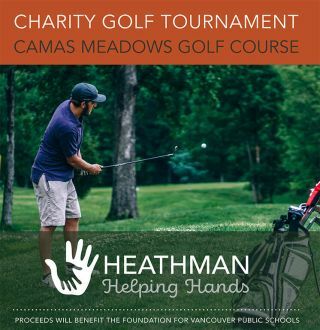 Join the Heathman Helping Hands for our Third Annual Charity Golf Tournament. Reserve your spot now and save. Find out more. 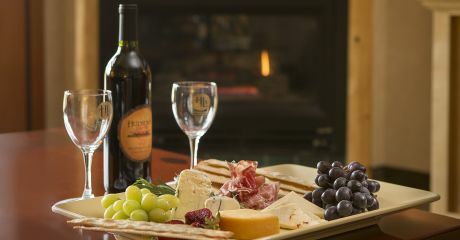 Pamper your palate for breakfast, lunch and dinner at Hudson’s Bar & Grill, serving tantalizing cuisine and a variety of regional wines in a warm, welcoming atmosphere. Olive Garden is a family of more than 750 local restaurants committed to providing every guest with a genuine Italian dining experience. It’s what we like to call Hospitaliano! : our passion for 100% guest delight. Two–hour narrated cruise on this 147–foot sternwheeler patterned after a 19th–century steamboat. This popular Vancouver marina offers boating, swimming and windsurfing as well as a place to sit back and enjoy the river views. Pearson Air Museum is home to training, military, experimental, and private aircraft from the Twentieth Century. Exhibits include aircraft from all over the world, a model of the lumber mill used to produce biplanes for World War I, military artifacts from both World Wars, kids activities, and more. When you step outside, there is a monument to the first trans-polar flight by Valery Chkalov, during which he and two others flew from Moscow, Russia and landed at Pearson Airfield. Pearson Airfield is the oldest continuously operating airport in the Pacific Northwest. The airfield opened in 1905 and is still an active airport. Visitors may enter the museum for free, though donations are gladly accepted. That the Old Apple Tree began as seeds in a pocket would not be all that spectacular, except that these seeds were given as a going away gift to Emilius Simpson as he departed London, England. Sometime shortly after his arrival at Fort Vancouver, where his cousin Sir George Simpson was Hudson's Bay governor, Emilius would plant the seeds sometime in 1826. The tree gave its first fruit in 1830 - a single apple - and has produced a crop of apples every year since - for 188 years. Most apple trees live anywhere from 50 to 70 years. The Old Apple Tree is believed to be the oldest in the Pacific Northwest and is the matriarch of the apple industry in Washington. Today, the tree stands at the end of the Land Bridge between the Columbia River and Fort Vancouver. Every year, the City of Vancouver holds the annual Old Apple Tree Festival on the first Saturday in October. There, they give away tree cuttings from the Old Apple Tree. It is free to visit the Old Apple Tree, with easy parking along the river on SE Columbia Way. Green Mountain Golf Course provides three sets of tees challenging golfers of all ability levels. Fairway Village Golf Course is an interesting 9–hole course in Vancouver, Washington with tree lined fairways and well bunkered greens. Named for a local U.S. Supreme Court Justice who espoused environmental causes, this magnificent 168,000–acre nature reserve includes 25 miles of the Pacific Crest Trail, over 60 other trails and 59 lakes. The Ridgefield National Wildlife Refuge Complex in Ridgefield, Washington, features 5,150 acres of marshes, grasslands and woodlands. Half an hour north of the Lodge, the Cedar Creek Grist Mill is a working museum where volunteers use the water-powered stone mill to make flour, cornmeal, and apple cider. Visitors receive first-hand experience working with the equipment, and once the flour and meal are made, volunteers encourage them to take samples home. With various events throughout the year, you don't want to miss a single one. From Bread and Butter Day, to Cornbread Day, Treat Day, Strawberry Shortcake Day and Apple Cider Pressing day, these events showcase the many uses of this mill and others like it in the days before electricity. Powered by the 47-gallon-per-second flow, this is the only grist mill in Washington built in its original structure. Volunteers restored the mill to working condition between 1980 and 1994. Today, it is open to the public on weekends except for major holidays. Entry is free, but any donations will go toward the upkeep and continued operation of the mill. Beginning in the 1840′s more than 300,000 people began their Oregon Trail journey, living and writing their stories. Share in these stories with a visit to the dynamic End of the Oregon Trail Interpretive Center in Oregon City, Oregon. Experience the Portland area's oldest history at the Fort Vancouver National Historic Site. Initially built in 1824 by the Hudson's Bay Company, Fort Vancouver acted as a center of commerce for fur traders of various nationalities and the indigenous tribes of the area. Today, the Fort gives an idea what life would have been like in the early 19th century when the Pacific Northwest was the frontier. Give yourself a few hours to explore the Fort, with guided tours, cultural demonstrations, and other unique educational opportunities for visitors of all ages. Entry to the reconstructed Fort costs $7 per person or $30 for an annual pass for the pass holder and up to three adults. Relax with a classic cup of coffee and catch up on the news of the day before heading out for a day full of adventures at nearby attractions. Easily access the Portland International Airport and get where you need to be, whether arriving or departing from our resort. 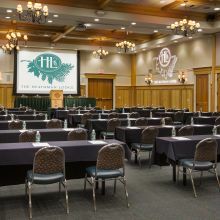 We all had such a wonderful time at our 30 year class reunion, especially due to the great staff at The Heathman Lodge! They were all very friendly, helpful, professional and there for us anytime we needed anything without being in the way. 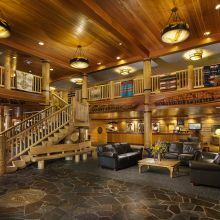 I would highly recommend an event and/or a stay at The Heathman Lodge. Very comfortable, spacious rooms too! Beautiful atmosphere, comfortable room, nice balcony, gorgeous lobby, Keurig coffee pot , great shower, nice bathroom. Honestly I have no complaints! Courteous staff. We will be back! 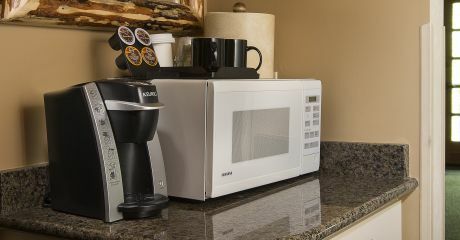 They have a microwave and refrigerator , flat screen tv , free wifi and a 12noon checkout! We were rushing to get out by 11 and then realized we had another hour!